BACKGROUND AND PURPOSE: Diagnostic selective cerebral angiography is commonly performed via transfemoral and transbrachial approaches. With these approaches, however, patients occasionally suffer serious complications. The purpose of this study was to evaluate the feasibility, efficacy, and safety of a transradial approach as an alternative to the transfemoral and transbrachial approaches. METHODS: Between October 1998 and September 1999, transradial cerebral angiography was performed in 166 consecutive patients in a single center as a diagnostic procedure. Before the procedure, we confirmed the collateral blood supply to the hand from the ulnar artery using a modified Allen test. Regular catheterization techniques were practiced using our newly designed 120-cm-long 4F catheter. In 42 patients, anticoagulant and/or antiplatelet therapy was given perioperatively. RESULTS: Twelve of the 166 patients proved to be poor candidates for the transradial approach, owing to restlessness (n = 9), lack of collateral blood supply via the ulnar artery (n = 2), and brachial artery stenosis (n = 1). The radial artery was successfully punctured and cannulated in the remaining 154 patients. Selective catheterization of the intended vessels was obtained in all carotid and vertebral angiographic procedures with no major vascular complications. CONCLUSION: Compared with transfemoral and transbrachial approaches, the transradial approach is a less invasive and safer technique for selective cerebral angiography and may warrant consideration as a standard procedure. Anticoagulant or antiplatelet therapy need not be discontinued for this method. Despite progress in cerebrovascular imaging methods, such as MR angiography and three-dimensional CT angiography, catheterized cerebral angiography is still a commonly used method for examining the cerebral vasculature. Diagnostic selective cerebral angiography is currently performed using transfemoral and transbrachial approaches in most institutions. Transfemoral angiography requires patients to tolerate uncomfortable compression of the groin and bed rest for hours after the examination, and the procedure may produce serious complications, such as local pseudoaneurysm, arteriovenous fistula, retroperitoneal hematoma, and pulmonary embolism (1–7). The transbrachial method is an outpatient examination and causes fewer attendant serious complications; however, it sometimes results in massive local subcutaneous hematoma, pulse deficit, and median nerve palsy (12–15). The transradial approach, on the other hand, was developed as a safe technique for performing coronary angiography in the cardiovascular field (16–21), and since 1997 we have adopted this approach for cerebral angiography (22). The purpose of this study was to establish the transradial approach as a standard method for performing cerebral angiography using a newly designed catheter, which minimizes examination-related risks, and to evaluate the feasibility, efficacy, and safety of this route as an alternative to the transfemoral and transbrachial approaches. Between October 1998 and September 1999, 166 consecutive patients at a single hospital underwent diagnostic selective cerebral angiography via a standardized transradial route for evaluation of cerebrovascular diseases. Patients requiring interventional procedures were excluded. The patients ranged in age from 14 to 87 years (mean age, 65 years) and included 90 women and 76 men. In 42 patients, anticoagulant and/or antiplatelet therapy was given perioperatively. The anticoagulant effect of warfarin was kept between 2.0 to 3.0 in an international normalized ratio, and heparin was administered to obtain an activated clotting time of more than 250 seconds. Satisfactory collateral perfusion of the hand was confirmed before the procedure by normal findings on a modified Allen test. In this modified version of the Allen test, the examiner manually occludes the patient's ulnar and radial arteries while the patient makes a fist, causing the hand to blanch. The patient is then asked to extend the fingers but to avoid hyperextension, as this may cause a decrease in perfusion to the palmer arch and result in a false interruption of the test. (If the patient has a consciousness disturbance, the examiner needs to clench the patient's fist and to extend the fingers.) Once the hand is open, the examiner releases the ulnar artery while continuing to maintain pressure on the radial artery. Adequate collateral circulation is considered to be present when the hand color returns to normal within 10 seconds after the ulnar artery is released and when no reactive hyperemia is present after release of the radial compression. We performed this procedure after obtaining informed consent from the patients. Patients were prepared and draped with the right radial artery site exposed at the wrist and the right arm abducted to 70°. The wrist was fixed over a gauze roll in an extended position. To prevent mechanical spasm of the radial artery, lidocaine tape was stuck on the wrist 1 hour before the procedure, and the skin at the puncture site was infiltrated with 1% lidocaine. A small incision was made over the radial artery, and the artery was punctured at the point of maximum pulsation, near the styloid process, using a 20- or 22-gauge needle with a modified Seldinger technique. A 0.025-inch guidewire was carefully advanced into the radial artery and a 17-cm-long 4F arterial introducer sheath (Slit Super-Sheath, Medikit, Tokyo, Japan) was placed in the radial artery. This arterial introducer has 15 slits in a spiral arrangement. The use of the accessory inner sheath permitted isosorbide dinitrate to contact the radial artery directly through the slits if spasm was encountered. The introducer was removed in the same way as a conventional sheath. This introducer is 4.74F in its inner diameter and 5.65F in its outer diameter. 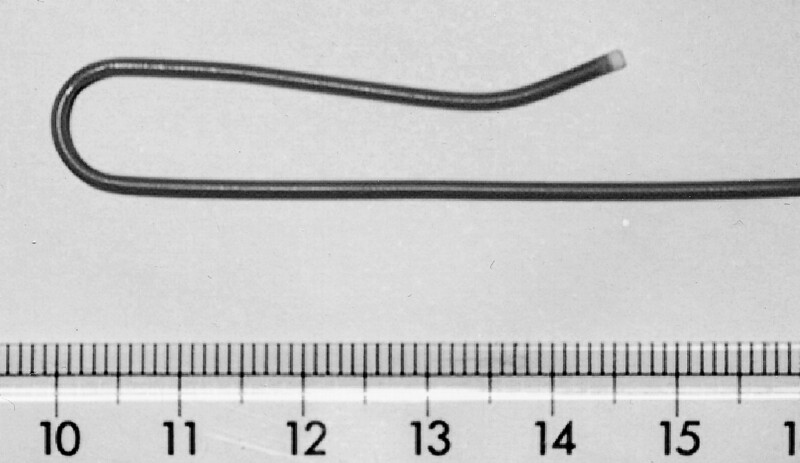 A newly designed 120-cm-long 4F modified Simmons catheter (Shinshu '98, Medikit) (Fig 1), which is coated with special lubricant and is soft enough to be advanced over the 0.035-inch guidewire, was used for selective catheterization of the cerebral vessels. As this catheter was soft, certain techniques were required to prevent it from kinking as it was advanced into the ascending aorta (Fig 2). The guidewire was then turned over above the aortic valves and the catheter was advanced over the guidewire until the tip of the catheter formed a J shape. Then the guidewire was pulled back to the curved point of the catheter. During the process of selecting vessels, the relationship between the guidewire and catheter was carefully maintained to prevent kinking of the catheter. An angiogram was obtained with a digital subtraction angiographic system. On completing the examination, a tourniquet (Adapty, Medikit) was placed over the puncture site immediately after the introducer catheter was removed; the puncture site was not compressed manually. The compression tourniquet was placed with a moderate pressure for 6 hours for hemostasis, while the patient was permitted to move the wrist, even immediately after the procedure. The transparent acrylic plate of the tourniquet permits the immediate detection of bleeding and other complications. Bed rest was not required. Patients were questioned as to whether they felt discomfort during the procedure and were asked to compare the technique with transfemoral angiography, if they had previously undergone that procedure. The total procedure time, including the time it took to enter and leave the examination room, was recorded. Twelve of the 166 patients proved to be poor candidates for the transradial approach, owing to restlessness in nine (5.4%), lack of collateral blood supply via the ulnar artery in two (1.2%), and brachial artery stenosis in one (0.6%). In the latter patient, the radial artery was successfully cannulated, but the procedure was terminated because a preexisting stenosis of the brachial artery was found, and a transfemoral approach was used to complete the examination. In the remaining 154 patients the radial artery was successfully punctured and cannulated. Selective catheterization of the intended vessels was obtained in all the bilateral internal and external carotid artery angiograms and in the bilateral vertebral artery angiograms (Table 1). No severe local arterial spasm was experienced during the procedure and no major vascular complications were encountered, such as cerebral infarction, upper limb ischemia, significant local hematoma, pseudoaneurysm, arteriovenous fistula, or functional disability of the hand. In four (2.6%) of the 154 patients, slight ecchymosis was observed around the puncture site without clinical symptoms. One (2.3%) of the 42 patients treated with anticoagulants (warfarin potassium in 12, heparin sodium in three) and/or antiplatelets (ticlopidine hydrochloride in 34) developed slight local ecchymosis (Table 2). In all patients, the radial artery was pulsatile and the modified Allen test was negative immediately after and 2 weeks after the procedure. No patients had functional disability of the hand, and no complaints of discomfort were reported on the questionnaire. The mean procedure time for the transradial approach was 39 minutes (range, 15 to 106 minutes) (Table 3). Numerous publications have reported on the feasibility, efficacy, and safety of the transradial technique for use in the cardiovascular field, both for diagnostic and interventional procedures (16–21, 23–25). We have been using this technique for selective cerebral angiography since 1997 (22). The reported rate of vascular complications associated with the transradial approach for cardiologic procedures is lower than that for the transfemoral or transbrachial approach (16–21, 23–25). Regarding the evaluation of the collateral circulation, the modified Allen test is the most commonly used screening study before radial artery cannulation. In our series of patients undergoing transradial cerebral angiography, only 2.4% had slight local ecchymosis, none with clinical signs or symptoms. This low rate might be the result of the smaller catheter we used in this series, rather than the larger catheter commonly used in transradial cardiac angiography. The compression tourniquet that we use also has lessened the risk of subcutaneous hematoma by allowing us to obtain more adequate and stable compression than achievable with manual compression at the puncture site just after removing the introducer catheter. Late occlusions of the radial artery are rare (26). In all our patients, satisfactory blood circulation of the hand and good pulsation of the radial artery were confirmed immediately after and 2 weeks after the procedure by modified Allen test. There were no major complications. Currently, selective cerebral angiography is performed primarily with the transfemoral approach in most institutions, mainly because of its easy access to the entire cerebral vascular system. This approach is, however, not possible in 2% to 10% of patients (16, 21), owing to peripheral vascular disease, and it is often hazardous in patients who receive therapeutic anticoagulation or in obese patients. Although 6.6% of our patients proved to be poor candidates for the transradial approach (because of restlessness or poor collateral circulation), the radial artery has a number of advantages over the brachial artery for arterial cannulation: it is superficially located on the underlying firm tendon, relatively fixed, easily compressible, and, most important, not an end artery. Because no major nerves or veins run in the vicinity of the radial artery over the radial styloid, neuropathies or arteriovenous fistulas are less likely to occur. The reported rate of local complications with the transbrachial approach is relatively high, ranging from 2% to 21% (12–15). As long as the ulnar artery is patent, no major complications stemming from radial artery occlusion have been reported with the transradial approach. In contrast, brachial artery occlusion can produce catastrophic complications that constitute a surgical emergency (12, 15). Anatomic variations have been found in the palmer arch arrangement; for example, in one series (27), ulnar perfusion of the hand was absent in 5% of the subjects, with total perfusion being supplied by the radial artery. In the present series, two (1.2%) of 166 patients had poor collateral blood supply via the ulnar artery. Failure of radial artery cannulation occurs in 0% to 10% of cases (16, 19), with most series reporting figures of 3% to 5% (18, 21). This exceeds the reported rate of failed percutaneous brachial access procedures (25). However, in our series, the radial artery was successfully punctured and cannulated in all patients. Especially for obese patients, the radial artery is an easier and safer access site. To prevent mechanical spasm of the radial artery, local anesthetic plus lidocaine tape may be effective. Anticoagulant and antiplatelet therapies are crucial for treating patients with ischemic diseases of the brain and heart. For reducing the risk of serious hemorrhagic complications, it is usually necessary to discontinue the anticoagulant or antithrombotic agents before the procedure. In the present series, however, we did not discontinue such agents, and no major hemorrhagic complications were experienced, such as significant local hematoma, pseudoaneurysm, or arteriovenous fistula. In one (2.3%) of the 42 patients who received anticoagulant and/or antiplatelet therapy perioperatively, slight ecchymosis was observed locally; however, this rate is no different from that seen in the overall patient population. It is reasonable to say, therefore, that anticoagulant and antiplatelet therapies need not to be discontinued for cerebral angiography with this method. With the transradial approach, the hours of uncomfortable groin compression and prolonged bed rest, which are required for the transfemoral approach, are not necessary. Furthermore, after the transfemoral approach, patients are usually kept in the hospital overnight for observation. If an adequate vascular closure device were used, there might be no need for either the groin compression or the overnight hospital stay (28, 29). Furthermore, after the transbrachial procedure, it is necessary to keep the arm in an extended position for several hours. In contrast, after the transradial procedure, no such special precautions are needed; this is an important advantage that relieves the patient from restriction of arm movement, especially when the examination is performed on an outpatient basis. Achieving access in the radial artery is technically more challenging during the initial phase of learning than it is for the brachial and femoral arteries. With experience, however, the time required for the transradial approach is no longer than that required for the transfemoral procedure, because prolonged compression time is not necessary. With efficient use of the guidewire, the new soft, smooth-surfaced catheter enables easy selection of both the external and internal carotid arteries for cannulation (see Table 1), and probably reduces the risk of local vasospasm. Our results indicate that the transradial approach could become a standard technique for selective cerebral angiography. The high procedural success rate and lack of major puncture site–related complications make the radial artery a promising entry site for selective cerebral angiography. Anticoagulant or antiplatelet therapy need not to be discontinued for this method. We acknowledge Masanobu Hokama of Shinonoi General Hospital for advice and encouragement regarding this manuscript, and Hiroyuki Yahikozawa and Naoto Hagiwara for their assistance. ↵1 Presented in part at the annual meeting of the Japan Neurosurgical Society, Tokyo, October 1999. ↵2 Address reprint requests to Kazuhiro Hongo, MD, Department of Neurosurgery, Shinshu University School of Medicine, 3-1-1 Asahi, Matsumoto 390-8621, Japan. The radial artery access site for interventional neuroradiology procedures.